So a while ago, I posted about a guitar that meatspace me has played from time to time for our SL gigs. You can find that post here. As it stands, Courtesan DeCuir has been after me for some time to get a new guitar. Courtesan is the Live Ambassador for OD Designs, who make some damn fine instruments. As I thought I may again be faced with meathead playing that guitar, I figured I’d commission OD to create an inwolrd inworld copy. I threw together some quick ideas, and sent them on to Ortho Vargas, the CEO of OD. Well, as it turns out, OD was not interested in bringing a full custom job in house. However, Courtesan forwarded my inquiry to Reyrey Clawtooth of R & R Guitars. I knew Reyrey previously, as she often plays bass with Electric Brit, with whom I often share a stage. However, it had somehow previously escaped my attention that she was a guitar builder. My mistake. Long story short, Reyrey took on the project, and delivered a guitar beyond my expectations, all at a very low price. Indeed, at a price about equivalent to a generic (though top quality) off-the-rack instrument. 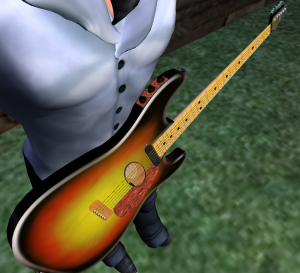 For whatever reason, I take some perverse pleasure in ensuring the guitar I play inworld is a close representation of the guitar being played by that other guy out in meatspace. 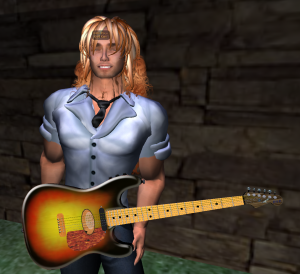 The guitar I typically play inworld is a slightly modified KLP F512 — modified to be almost a dead ringer of the Guild F412 12-string jumbo acoustic in the RL. I recently found myself controlled by that human while he was on the road. He doesn’t take his Guild on the road. Accordingly, it caused me some consternation to be stuck playing my KLP, while that human was playing a radiacally different axe. It seems logical to assume that that guy will do this again in the future. So I’d like to acquire another doppleganger. The problem is that this second guitar is quite distinctive — a custom thingy. I’ve not seen anything like it inworld. Accordingly, I’d like to explore the idea of commissioning a reproduction of the guitar in question. Of course, being your typical ignorant muso, I have no idea how much effort would go into such a thing, so I do not know where the cost/benefit analysis may pull me back to virtual earth. Perhaps I can describe it, and you can respond with what you may think practical. - General body outline of a strat, though being fully hollow, it is not contoured in profile. - Bookmatched spruce top, bookmatched maple back. - 3 color sunburst top and back, dark (orangey-black) sides. - Maple strat neck & fretboard, simple black dot inlays, small strat headstock shape. - Figured rosewood headstock overlay with bird inlay. Let me know if you have any interest whatsoever in building such a thing. Maybe you can ballpark a L$ cost for various subsets of the above wish list. If you are interested I’ll have that human out in meatspace snap some shots of the physical guitar for your reference. Again, see this post for the RL version. The happy artist with his new toy. Even cloned Elway’s and Davies’ signatures! Yup – slam dunk. Thanks Reyrey! 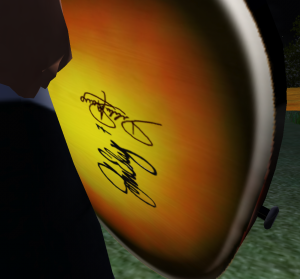 Here’s some snapshots of a RL guitar that guy in meatspace recently played for one of my inworld gigs. Kinda blurry — I just got a new cell phone, and I’m still learning the camera aspect of it.He calls it Old Number 7 because it’s been singed by John Elway — ex-#7 of the Denver Broncos. The other sig is rumored to be blueswoman Debbie Davies. Also including one snap of the guitar meathead usually plays. You’ll no doubt note it bears a strong resemblance to the one I usually play.